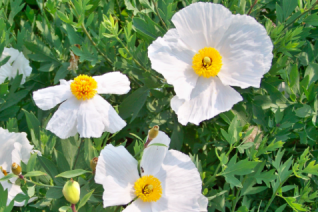 Improved version of the Matilija Poppy that we love to let colonize our dry hillsides. 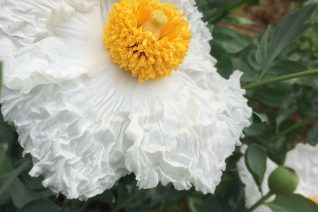 Enormous 8″ wide ruffled pure white flower petals surround a furry central yellow zone. This cultivar has bigger flowers, more of them and bluer foliage. Unfortunately, it is no less vigorous and will take all the real estate you can give it. Thats easily 10′ x 35′ in 5 years. Best in contained areas. Full sun and average, well drained soil. To 8′ tall in bloom. Transplant very carefully, do not disturb the roots- rather dig a hole and gently set the whole undisturbed rootball in there. Water regularly for the first season to establish then none in subsequent years. Stems will usually freeze to the ground in winter. Removes these in February before new growth starts. Strongly deer resistant. Native to S.California.